Almost all the parents want that their children go to the school in time with everything they need – like books, copies, lunch box, water bottle etc. But with the prescription of the long list of textbooks even to the Nursery students, it looks that they have now been weighing their school bags as the combined weight of everything they are having to carry to and from school is causing rapidly increasing concern among back specialists. With the availability of eBooks, interactive assignments, and web-based learning, the senior students are relieved of heavy college bags but the heavy for the school going children could lead to backaches and hunchbacks. 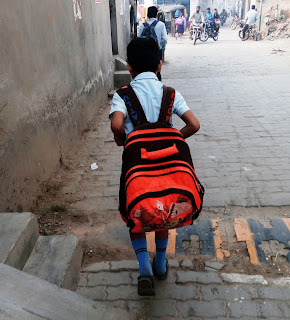 As per the latest study by ASSOCHAM, around 68 percent of school children in India risk backaches, given a load of books in their bags. According to the survey, over 88 percent of children in the age group of 7-13 years carry more than 45 percent of their weight on their backs including art kit, skates, taekwondo equipment, a swim bag, cricket kit every alternate day leading to serious spinal damage and irreversible back problems. While as per the Children’s School Bag Act 2006, in any case, a schoolbag should not weigh more than 10 percent of a child’s weight. Another study shows that carrying anything that weighs more than 15 percent of a child’s weight will be casing spinal damage whatever bag you use. In my later morning walk at the start of the winter season, I could not resist from clicking the photograph with a heavy load of backpacks on the back of the children who was feeling difficulty in walking. I was watching that tortoise-looking kid hunched forward to counterbalance by moving up and down and one can well imagine the 12 years schooling impact of backpack-toting has on growing spines. The trend of carrying the bag on should even among the small school going children or on the crook of their elbow put a great strain on their spine. When talked to professionals, they said although heavy bags do not have long-term problems or spine deformities they do cause the head and shoulders to lean forward producing neck and should muscle pain especially when the weight of the back is not evenly distributed across the back. While the bag should not be more than three-quarters of the length of the child’s shoulder blades and waist, it should fit properly on the back of the child. The bag must have side pockets to distribute the weight evenly for things like water bottles, they added. Frankly speaking, if children start getting back pains at the school age, then there is the possibility of they will have it lifelong which may affect the growth of the musculoskeletal system especially if the children carry the bag on one shoulder. The education authorities have to take it seriously besides parents insisting that their children pack their bags only with what they need for the next day and ensure that they are worn on both the shoulders. To shorten the weight of the bags, the teachers can ask the students to keep the textbooks at home. There is also a need to start the old system of providing appropriate lockers in schools which law also stipulates that nursery and kindergarten students should carry no schoolbag and school authorities too should ensure to follow the guidelines on bags.